This piece of beadwork forms part of my Geometric Beadwork Series and was beaded in the first week of January 2008. I beaded it so that alternate triangles pointed alternate ways which gives it a different effect to my previous triangular pieces i.e. Geometric 3-4-1. 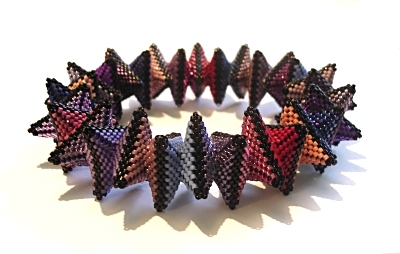 It uses black cylinder beads along with 30 different colours and will form part of a 2-piece set. You can see a different view of this bracelet here.